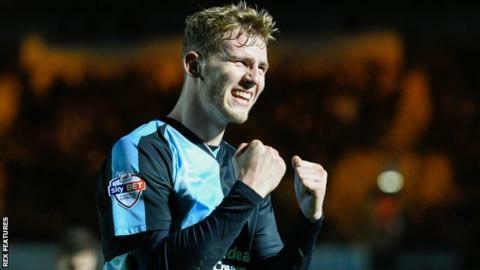 It's been quite a few days for Wycombe Wanderers defender Jason McCarthy. The 20-year-old had to take over in goal for the closing stages of Saturday's defeat by Morecambe, extended his loan from Southampton on Monday and the following day was nominated for the League Two player of the month award. After 83 minutes of Saturday's League Two match against Morecambe with Gareth Ainsworth's side losing 1-0, Chairboys goalkeeper Matt Ingram was sent off for bringing down Aaron Wildig in the box. Having used all their substitutes, the hosts were forced to put an outfield player in goal. McCarthy was that man, but was unable to keep out Jamie Devitt's spot-kick. "That was mental. It's not something I thought I'd do in my career, it was pretty weird," McCarthy told BBC Three Counties Radio. "With all the chaos going on I sort of volunteered and apparently one of the lads on the sidelines said I'd throw myself at it because I'm quite a committed player and it ended up being me. "I've had a lot of abuse for my diving attempt when trying to save that penalty." McCarthy's loan from Southampton - for whom he has made just one substitute appearance - expired on Sunday. But he has now agreed to stay on for a further month. and hoping to face Aston Villa in the FA Cup at the weekend. "It's great news for me," he said. "Obviously the long-term goal is to break through at Southampton, but in the meantime it's great getting first-team experience at Wycombe. "It's a really good time to be at Wycombe and a big month ahead with the FA Cup third round tie and we're in the play-off positions aiming to go higher than that. "All parties agreed over the extension, why not? Let's go again." McCarthy has made 15 appearances for Wycombe since arriving in October, helping his side to five clean sheets from those games. And he has been rewarded for his performances in a month in which Wycombe won four of their five matches and rose to sixth in the table. McCarthy says he is trying not to get too carried away with his award nomination. "It's not just my own personal performances, the team has been performing really well and the manager has given me the chance to show everyone my ability," he said. "Luckily I've been able to repay that faith - I'm playing well and enjoying it. It's just a bonus for me but, of course, I'm really happy that I've been nominated. "I'm learning about the game now. If it's 1-0 you never hear about the clean sheet, you hear about the guy that scored the winner - so it's great to get some recognition and know I am doing some good."